Relax and enjoy one of our wonderful treatments safe in the knowledge that your in good hands. Get toned and relax in private in our conservatory, let the stress of the day melt away as you tighten your muscles. 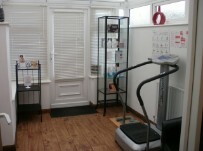 From entering our salon you will be greeted in a proffessional and friendly manner. Relax and enjoy a coffee, were here too look after you! We have over 36 years experience in the nail industry. The love we have in this field keeps us bang up to date with any new technology and styles.